Many thanks to the teachers and students on my campus for putting up with me this week. Fresh from TCEA and full of fun new ideas, I got hooked on QR codes after attended a class by the Digital Goonies and just couldn’t help myself! I put QR activities in the teachers’ lounges, hung QR codes in the hallways and placed little QR codes on the tables in the cafeteria for students to read. Students were actually asking me for more codes to read! It was really, really fun! When I first heard about QR codes, I did’t know why substituting one object for another would even matter, but it is absolutely fun! It brings the “game” concept and the mystery of the “secret code” right into the classroom. For those that missed the excitement this week at school, a QR code is a quick responds code that can be scanned, like a bar code. To read them, you need a reader on your device–smart phone or iPod Touch (needs a camera!). Digital Goonies recommended i-nigma, which can be downloaded from iTunes and from the Android Market . After trying several other readers, I agree that this is the fastest and easiest to use. 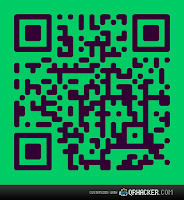 QRstuff has more output options (download, print and e-mail), but you can’t change the background color. QRhacker allows you to change the color of the background and foreground and add pictures into the code right on the site, though I struggled to find a suitable graphic that would work.The only output option is to download or screenshot. Also, when renaming a saved code, make sure you include the .jpeg extension or it won’t open! 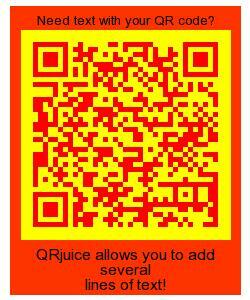 If you want to add text above or below the code, for creating flashcards or other labeled codes, QRjuice is the fastest option. You can also change both foreground and background colors, but you have to e-mail it to yourself or take a screenshot of the code. If you want to play with the colors of the QR code, you will need the 6-digit hexadecimal code. 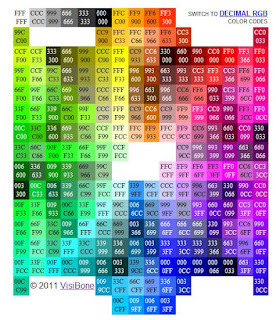 I just “Googled” that and quickly found a site by Visibone that has a wonderful cheatsheet listing all the different colors. Once again…fun and easy to use! Since 30% of the QR code can be “destroyed” and still be legible, QR codes can be manipulate in any photo software—or even in Word–in order to add pictures, shapes, or cool designs. I am still messing with this, so the fun just keeps on coming! If you still can’t believe that these codes would add new energy and an element of excitement to your classroom, check out these websites for QR code ideas. If you need any help, just let me know!